Various brands are claiming that they are the best callus remover in the market. However, some of them can do little to nothing to remove your calluses while some brands are too harsh for the skin. Although this type of product is not new for most of us, still not everyone knows how it can help them. What to look for in a callus remover? If you have been disappointed on how the result turns out after using a callus remover, it is about time to replace it. Your device might lack the right features to remove hardened skin and helps repair it. You can usually develop calluses on areas where you apply greater pressure such as the palm, soles, heel, the ball of your foot and underside of the toes. There are plenty of callus remover types that have ergonomic designs and enticing colors. However, the appearance shouldn’t be our top priority here. Make sure that the device has a feature to pulverized dead and hardened skin. Newer versions of this device are battery-operated which makes it easier to use compared to manual types. Look for the device that allows you to choose multiple speed settings so you can adjust the power of the device according to skin type. Others also opt for a device that is “spring open”. It enables them to just squeeze the sides of the device and the roller will pop out. Look for the brand that has a safety mechanism to ensure that it will not come loose while in use. While calluses are basically “protecting” the skin from too much rubbing, friction, and pressure, they may still feel and look unpleasant for most of us. They tend to be rough and look brownish or grayish but are rarely painful. Those who have less cushioning tissue between their skin and the bones of their feet are more prone to developing calluses. Although calluses are not life-threatening, they can still lead to serious health issues like nucleated skin lesion if left untreated. These lesions can be extremely painful as they tend to develop under the skin. Worse cases result to difficulty in walking and standing. The most common causes of developing calluses include wearing footwear without socks or wearing the wrong size of footwear. In most cases, calluses will gradually disappear when the pressure stops, but there are instances where you need to scrape it to reduce its thickness. Callus removers are like scraping tools. You can still use the traditional types wherein you need to soak your feet first in warm water before using the device. There are also electric types that are easier and effective to use. The best callus removers can help you eliminate the tedious work of removing calluses. The device can get the task done faster. But, be sure that you are only choosing the right type of callus remover to avoid serious skin issues and damages. If you are diabetic, it is important that you consult your doctor first before using any callus remover, especially if you have calluses that contain bloody flecks. Likewise, those who are suffering from poor blood circulation or have nerve damage in their feet are not advisable to use callus removers as it may cause serious damage when you remove too much skin. Avoid self-treating foot callus if you have these medical conditions to avoid having an infected open sore. Always consult your doctor first as there are also approved brands of callus remover. Good thing that we have the option in terms of brands and type of callus remover and treatment. Modern types range from battery-operated to those with power cord. We come up with our short list of the best callus removers in the market nowadays. These models ranked higher in product reviews and can suit various personal preferences. 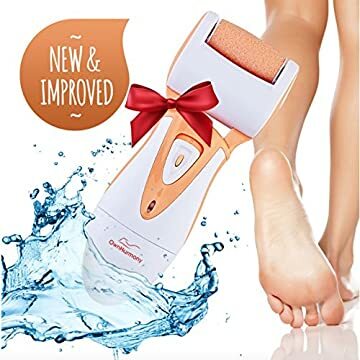 This Electric Callus Remover makes it to our list of the best callus removers in the market because of its rechargeable features. • You can use it multiple times in just one charging. • It is as if you went to a professional spa because of its spa-quality results. • You only need one set batteries and charge it when needed. • It features an ergonomic design, comfortable built and can be used with ease. • According to users, it is better performing compared to scrubs, stone or manual foot files. • It also has a safety lock button to prevent untoward incidents. • Its roller is made from quartz crystal micro-mineral that is known to be durable and helps in soothing the rough skin. • Its roller also features a convex curve so you are sure to hit arches and other difficult spots. 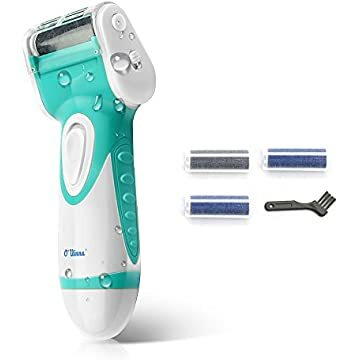 • No more running out of batteries or using cords.However, this callus remover is powerful so you should be mindful not to apply too much pressure on the same area for 3-4 seconds. This callus remover from Naturalico acts as a foot exfoliation device which helps in reducing dead skins and thick calluses. · Faster than traditional callus removers such as pumice stones and files. · Less abrasive unlike other powered callus removers so you are sure that it is safe for use if you have sensitive skin. · It features a foot file that spins at 360° with a speed of 40 turns per second. · The battery is also rechargeable with a 1200 MaH capacity. · It also has a LED light illuminator to help you see the calluses better. · It is said to be one of the fastest callus remover devices in the market today. · Likewise, it should not be used with hard pressure to prevent injury or skin damage. 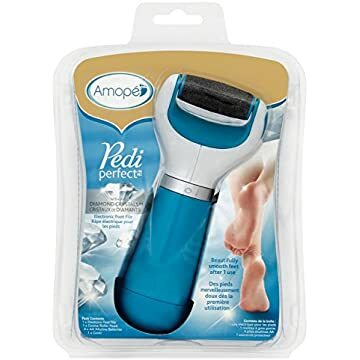 This callus tool from Amopé is said to be effective yet, gentle on the skin. It easily removes thick and hardened skin. • Users like that it has a refillable roller head (Micralumina) allowing you to replace it when it’s already worn out. • The ergonomic design makes it easier for you to grasp the handle and easily manipulate the device. • Unlike other callus tools, this one has no sharp blades and only uses Micralumina roller head. • The downside is, it requires 4 AA Batteries to operate and has no plug-in option. It is only suitable to use on feet and not anywhere else. Like the other electronic callus tool, do not apply hard pressure on it. It is also recommended to be used with dry skin. This by far is one of the most innovative callus removers nowadays. · It is compact and handy which makes it perfect to go with you on holidays and vacations. · It does not only removes dead and hardened skin. It can also polish fingernails. · It features grinding rollers that spin at 360° with a speed of 40 turns per second. · Works fast compared to other callus removers because of its powerful motor. · Customers love that it can be used before or while bathing. · The rollers are interchangeable and the product comes with replacement rollers. · However, it doesn’t have plug-in options and requires 2 AA Alkaline Batteries. This Micro-Pedi POWER Callus Remover makes it to our cut of the best callus removers because of its unique features. • Its roller spins 30 times a second at 360°. It is gentle to the skins and can easily remove hardened skin. • You are sure to save money on batteries as it comes with plug-in options. You can still bring it anywhere with you because it has an international travel power cord. • Among our list of callus removers, this is the only brand that is approved by the American Podiatric Medical Association. • Its roller is made with micro mineral particles that are safe and effective to use than pumice stones or metal scrapers. 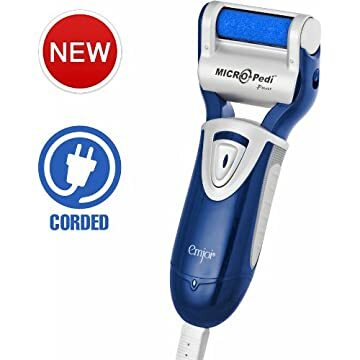 We really saved the best for last so it is safe to say that the Emjoi Micro-Pedi POWER - Callus Remover wins this category. It deserves to be in our shortlist of the best callus removers because of its awesome features. Approved by the American Podiatric Medical Association, this device sure underwent various testing to ensure its safety. Save money while keeping your skin looking healthy and callus-free. Avoid all the intense pain, abrasions, and burns when removing callus and achieve that spa-quality in no time. However, make sure that you are fit to use the callus remover to avoid further damages or health issues. We hope that you finally found the best callus remover for you or for your love-ones.